In today’s crazy world it is very challenging at times to raise a family, no less a family with four children. One way to overcome some of those challenges is by doing things together. In our activity there are many stories out there about families involved in drum corps. Meet the Armstrong family from DCA’s southern powerhouse, Atlanta CV. 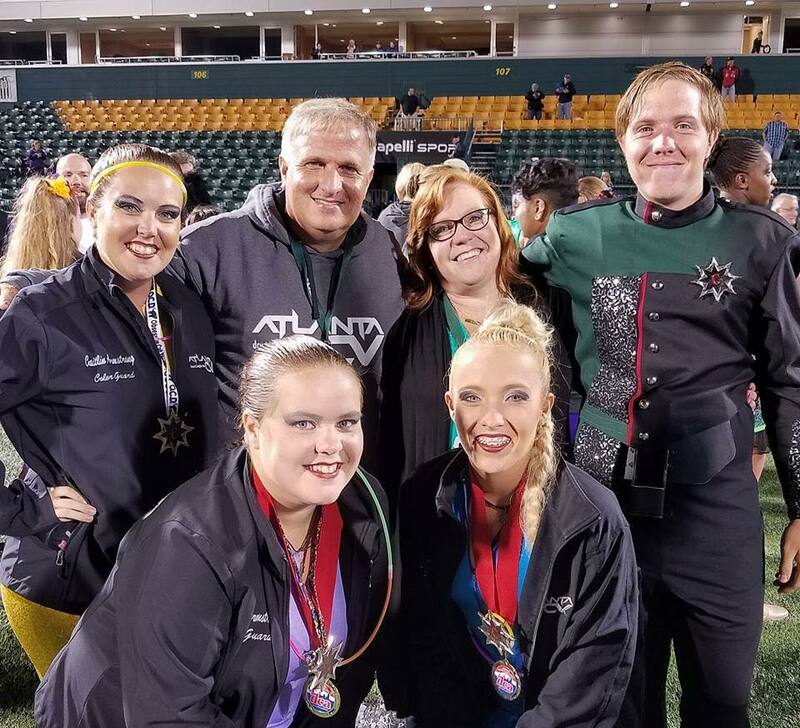 Alan, his wife Ginger and their four children, Caitlin, Kelsey, and twins Emily and Ryan have a long and extensive history in the pageantry world, participating in band activities, winter guard, and obviously drum corps. Alan Armstrong had to be talked into auditioning for Spirit of Atlanta for the 1982 season by his band directors and another snare drummer who was also trying out. He made the line and was moved to lead soprano his rookie year. By 1983 he was one of the section leaders and soloists and marched with the corps in those capacities until aging out in 1986. In 1986 the corps was too financially strapped to really pay a brass staff so Alan and a few other vets in the line served as marching members and the brass tech staff during their age out year. He started as a full time staff member with Spirit in 1987. Due to his responsibilities as a band director and later as a young father, he taught there off and on in various capacities up to and including caption head and arranging consultant through 2001. After stepping away from Spirit, his drum corps career went in several varying directions. He helped start a Division 3 corps in Atlanta in 2003 called Court of Honor and served as the brass caption head and arranger one season and the Program and Instructional coordinator for the two years of that corps existence. In 2005 he worked as the Brass Caption Head at Memphis Sound, and from 2006 till 2012 he served as a judge for DCI. Alan joined Atlanta CV in 2008. He initially came on board as a favor to his old friend David Henry who was the Brass Caption head at the time. The original agreement was to help with a few sectionals as a favor to Dave. After a few rehearsals, he was asked to take over the Visual program as Caption Head where he served for two years. In 2010, he took over as Brass Caption Head when David Henry had to step away due to family responsibilities. In 2012, he began serving as Staff Coordinator. As each year went by he became more and more involved in handling the programming for the corps until 2015 when he moved into a more extensive role in putting the program together. Alan now serves as the Program and Instructional Coordinator and is responsible for piecing the show together and then facilitating the caption heads and staff to help ensure the instructional program prepares the corps for the season. Alan stated “It’s truly a team effort with Atlanta CV as the design team and caption heads are all involved in the process of developing the show and I still help run rehearsals and clean the show sometimes as well. We just all do what needs to be done”. In addition to his duties with CV, in 2014 he was asked by Dave McGrath to join a group of educators from Atlanta who were going to take over the brass program for the Cavaliers. The group included Freddy Martin, who is one of Alan’s mentors from his days at Spirit, and several of Alan’s former students. He now serves as an ensemble specialist for the corps. In 2016 when Spirit was reorganized under new management, he was asked to serve as a consultant for the corps. He donated what little time he could to his ” home team ” for the past two years and will continue to do what he can to help his friends and former students as they reestablish Spirit in the years to come. This is one busy man with quite an extensive background in the activity. DCA has benefited their family greatly. Alan and his wife Ginger taught CV together for a couple of seasons with her serving on the guard staff and Alan as the Brass Caption Head. They have worked together with Alan’s various band programs over the years and Ginger’s first year on staff with the corps was the first year their oldest daughter Caitlin marched. The 2017 DCA season saw all four of the Armstrong siblings wanting to march together and join in the corps 20th anniversary season. This was also Alan’s tenth year with CV so it was a special season to share with the entire family being involved. 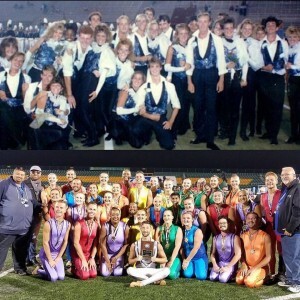 The icing on the cake of this unique experience came when the three Armstrong girls won the DCA guard championship exactly thirty years after mom Ginger won her second DCI guard title as part of Spirit’s guard! Alan has been a band director for the past thirty years and now serves as Director of Bands at Northgate High School where he’s been since opening the school in 1996. Ginger has been the guard director there as well since the school first opened. Alan and Ginger met and later married thanks to the Spirit of Atlanta. They were introduced at a performance the corps did for President Reagan in June of 1985. After spending more time together they ended up being seat partners that summer. They announced their engagement at the corps banquet in the summer of 1987 and were married in June of 1988. They have been involved with teaching, working, volunteering with bands, winter guards, and drum corps ever since. Oldest daughter Caitlin actually turned one year old on the road traveling with Spirit while Ginger was volunteering with the souvenir staff and Alan was teaching the hornline. All four of their children have grown up around bands, winter guard, and drum corps their entire lives. Though he doesn’t have much spare time, Alan does enjoy spending time writing music for fun and also likes reading when he can. He is a big sports enthusiast and enjoys watching his favorite teams play either live or on television and said he always loves an evening with Ginger and all his kids doing pretty much anything as long as they are together. Ginger began her drum corps career with the Houston Nighthawks in 1982 at age fourteen. She marched there for three years before the corps folded. She and Alan actually marched in their first drum corps show the same night in Opelika, Alabama back in 1982, but it would be three more years before they would meet after she joined Spirit of Atlanta. She marched there for three years (1985-1987) and was part of both their world championship guard seasons. After starting her first season in DCI at fourteen, she began marching in WGI at age fifteen. She marched six seasons of DCI and three of WGI before she started teaching color guards. Ginger teaches both the fall and winterguards at Northgate High School. The Winterguard has competed as both a scholastic group as well as an independent unit from 2005-2010. The scholastic groups have multiple circuit championships to their name and the Independent group made WGI A Class finals in 2008 and WGI Open Class finals in 2009. Ginger got involved with DCA through Alan and spent a couple of summers as a guard tech. This past season she rejoined CV and did video PR work for the corps. The activity that brought them together has remained a huge part of their lives. The day they returned from their honeymoon in Maui. they drove straight from the airport to corps rehearsal that day! Two years later, their oldest daughter Caitlin, went to her first drum corps show at ten days old! Outside the pageantry arts, Ginger was a high school math teacher for 14 years. In 2009, she left the traditional classroom and started teaching at one campus of Children’s Healthcare of Atlanta working with kids who were in the hospital for a heart, liver, or kidney transplant. In 2011 she moved to another campus of the same hospital system and starting working with kids battling all types of cancer. In 2013 she was named the School Program Coordinator and now supervises a team of fifteen teachers at three different hospitals. Her current career combines her love for children and education in a unique way. For her, she feels it is a great way to use her degree and experience as a career educator. Drum corps has been a part of her children’s everyday lives since they were born and she credits the pageantry arts activities they have been a part of for developing many of their life skills. They learned to be responsible, adaptable, adults who understand the values of teamwork and pushing through adversity. Her kids grew up knowing they had a TON of other people who cared about them and wanted them to succeed, and they have grown into adults who share that work ethic and passion with others. From a truly practical standpoint, all these activities have allowed them to spend more time together than most families, while doing something they all love. Ginger taught and wrote for the guard at Northgate with her oldest daughter Caitlin for the last several years. A few years ago, they started gradually transitioning Ginger out and Caitlin in. She is still involved but Caitlin is now taking the lead with the program. Ginger’s brother, Eric Hodges, marched drum corps with the Houston Nighthawks also from 1982-1984. In her spare time Ginger is Vice President of the board for the winter guard program her youngest daughter, Emily, marches in. Free time involves going out to dinner with friends, shopping, knitting, and other craft projects. She also volunteers at WGI regionals and world championships every year “just for fun”. Caitlin Armstrong is the oldest daughter in the family and started her drum corps experience by marching color guard with Spirit of Atlanta in 2008 and 2009. She then marched with Atlanta CV in 2010 thru 2012, 2014, and in this past season. Her experience in color guard has paid off as she began teaching at Northgate High School since her senior year in 2008. Caitlin was also a member of the school’s WGI Independent Winter Guard and helped teach their scholastic unit. She has been the school sponsor and Co-Director since 2015. Caitlin chose DCA because of after marching DCI for two seasons, she knew she could not ask her parents to help her pay for three more summers and still attend college. She had many friends from the winter guard program who had marched with CV’s guard and figured she would check it out. She was able to take summer classes online and take care of her corps dues without putting a huge financial burden on the family. She had always intended to go back and march DCI again, but after two different negative audition experiences, she realized that CV was her home. Drum corps has benefited her greatly since 2010 when she started marching CV. Her mom and dad were staff members and sister Kelsey was babysitting for a couple who was marching in the corps. In 2017 when Caitlin returned to CV for her Gold Star year with the corps she thought she would be the only Armstrong marching, but that quickly changed as the next thing she knew all four of the Armstrong siblings were given contracts! She was initially anxious about this and almost turned down her contract because she wasn’t sure the world was ready for three Armstrong women in one color guard, but she was so very thankful that she did not. Caitlin stated ” The saying that drum corps people become your family is absolutely true, but sharing the field with my biological siblings was an incredible feeling, and knowing that our parents were in the stands on Finals night, watching us pour our heart and souls out onto that field was a memory of a lifetime. The summer definitely had its ups and downs, but especially after the trials we have gone through with Emily’s illness over the past few years, all of us doing this activity together was very healing”. In “real life”, Caitlin teaches Georgia Pre-K in a Title One school and has twenty-two students who range in age from 4-5 years old. This is her fifth year teaching and her third year at Poplar Road Elementary. It is a full day program that follows the same calendar as K-12 in her school district. She truly adores her job because she gets to help her students foster a love of learning from an early age, and she gets to help them build a strong foundation for the rest of their educational career. She also gets to watch her ” babies ” grow up as they move on into Kindergarten and beyond. The job does take a lot of patience, but it is worth every moment. The 2017 DCA Season was truly a special one for Caitlin and the World Champion color guard. Each year on prelims night, CV holds their end of season banquet. After the banquet, Caption Head Victor Mooney, announced to the guard that they had scored a 19.7 with their prelims run which they felt could have been much stronger. There were only three people affiliated with the color guard who had been there for all five years that Caitlin had marched. Victor Mooney, Brandon Dailey and Cody Segers who were all staff members this season. After Victor announced the Prelims score, Caitlin broke down in tears because it was so hard to conceive how far the CV guard had come from when she started marching back in 2010. 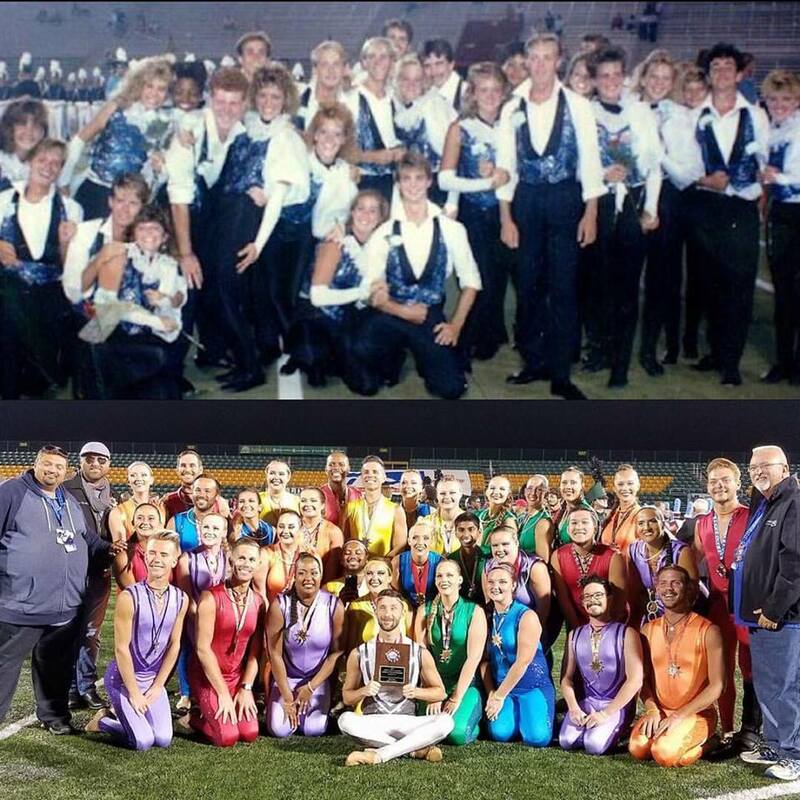 Not knowing where they placed at prelims, they spent finals day enjoying each other and their show, and went onto the field at finals just hoping to have the run of their lives. She held Cody’s hand in the retreat block as he filled a spot last minute when one of the members got injured. She along with many of her colleagues were in shock when they heard them call them out the high guard award and the corps in second place. Caitlin went through some personal struggles this summer and the guard was there for her every step of the way! Though she has little spare time, when she does she loves to go hiking, developing her skills as a VERY amateur photographer, go on cruises with her best friend Gary who is also a member of CV’s guard, and snuggling with her cats Sirius and Lily. Kelsey Armstrong is the middle daughter in the Armstrong family and first marched with Atlanta CV in 2012 and 2013, then took some time off to finish her bachelor’s degree in music education but then returned this past summer for the corps 20th anniversary season. Having been around the organization as a family member since 2010, and a member since 2012, Kelsey felt that this past season was a reward for all of the hard work it took to build the guard program and the whole organization up to its current caliber. She chose DCA because as a high school graduate looking tuition and textbook prices in the face, DCA made financial sense. She saw how much fun her older sister Caitlin had in the guard and felt that at the very least she could start at CV and then march somewhere else when she had more ability to support herself. Continuing at CV was a decision she made partially because of the family she became a part of as she joined the CV guard, and the people she knew would miss out on spending a summer with if she went elsewhere. That decision was also made in part due to the fact that she set a goal for herself to finish her Music Education degree in four years, and spending the entire summer on tour wasn’t conducive to that. She was able to teach band camps, take classes, and march all during the summer which would have been impossible marching junior corps. Kelsey felt that one of the main benefits of her time at CV was that it made it possible for all of the family to come together and be a part of the same organization. Because of their ages, none of the Armstrong children marched together in high school. Kelsey and Caitlin marched together for the first time during Kelsey’s first season at CV in 2012. While as an eighteen year old she still had quite a bit of growing up to do, Kelsey and Caitlin were able to create a relationship beyond big sister/little sister and see each other as young adults. That same thing happened with younger sister Emily and brother Ryan this summer, and has enriched their relationship outside of marching drum corps as well. Having her entire family doing drum corps together can get a little hectic at times, but she said it was also nice to be able to spend time together. They have joked in the past that if they didn’t do marching band or drum corps activities together they would never see each other. 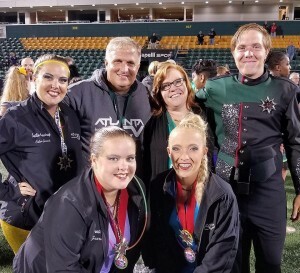 Their jobs and lives pull them in different directions a lot of the time, but band and drum corps is something they can all do and enjoy together, which is not something all families have. Kelsey was one of the primary instructors for the J.V. winter guard last winter at Northgate and serves as a guard tech in the fall. While she loves teaching the little kids during the day, working with older students towards the goal of those electrifying performance experiences she has had herself helps her stay connected to the guard world she loves even when she is not marching. This also gives her an opportunity to help students perform at a higher level than is possible/appropriate to expect out of elementary aged students. It has been very special for Kelsey to come back to the program that she grew up around and then performed with throughout high school and “give back” by teaching the next generation to strive for that same level of excellence that she was taught both by her parents at home as well as in the marching band and guard program as a student. In “real life” Kelsey teaches Elementary music, which means she teaches every student in her school, grades K-5 at Burnett Elementary School in Douglas County Georgia. She says she enjoys teaching this age because Elementary school is the only time when a music teacher gets to influence every student in the school to love music. When students get to middle and high schools, they have to choose to be a part of music programs, and if they haven’t had a love for music instilled in them already, they are far less likely to choose that path for themselves. She graduated from Columbus State University in the Spring of 2016 with a bachelor’s degree in Music Education. She considers herself to be a huge nerd and loves to read, especially Harry Potter. When she gets the chance, she loves to ride roller coasters, and sing with a community choir called the Masterworks Chorale which allows her to keep pursuing the high level of music she was exposed to in high school and college. Emily Armstrong is the youngest Armstrong daughter and is also a twin with brother Ryan. Emily just finished her first year with CV’s guard and previously marched in Northgate High School’s guard starting in 2012. She is in her first year of teaching guard at Locust Grove High School. Emily chose DCA because of health situations she has battled for a little over two years. With that in mind DCA was the safest option for her. Emily suffers from gastroparesis which makes eating a challenge sometimes and a DCI food truck wouldn’t have been able to accommodate her needs. Her health issues are improving and she is planning on auditioning for the Crossmen and Bluecoats. DCA was the first taste of drum that she received and remembers being younger and seeing Atlanta CV and thinking that was so cool. She watched her older sisters grow with CV and then got to see her brother experience new things when he marched for the first time in 2016. Getting to experience this with her whole family was the biggest blessing and they couldn’t have been more fortunate for it to have been in this historic year for CV. Being a rookie member in CV’s guard and winning best guard honors at finals was probably the most shocking and also most rewarding thing she has ever experienced. The summer of 2017 was not easy for her by any means, but the lessons learned and the memories made were worth all the trouble. Emily held hands with her sister’s old DCI seat partner and family friend during retreat and seeing the tears stream down his face when they all realized what they had accomplished was incredibly emotional. She couldn’t have asked for a better group of people to spend her summer with. Marching alongside her family members and the success Atlanta CV had this year felt like the ultimate gift to Emily. Her siblings and parents have been her biggest support system her whole life, and they’ve been the ones pushing her to chase her dreams of marching. To know that she got to not only be part of a group that made CV history, but she got to do it standing beside the people who inspired her to start this activity in the first place was amazing. She is planning on becoming a special Ed teacher because from the time she was young she always felt that she should help those who were misunderstood. People don’t take the time to understand the science behind why certain conditions make kids act certain ways. Emily feels that if she can offer a good education and hopefully someone who can be a friendly face and helping hand during those difficult formative years, then maybe she can be part of a shift in culture where special needs doesn’t mean strange or weird to their classmates, but just different in their own ways. In her spare time Emily likes to write in a blog she has, and also likes to draw and make things to hang up around her room. Ryan Armstrong joined Atlanta CV in the summer of 2016 as a member of the snare line. He chose DCA to march with CV primarily for financial reasons. He also didn’t feel he was ready for junior corps from a mental, physical, and skill standpoint. CV was a good starting point for him to grow and he hopes someday to march DCI as well. He has also marched with CVI (the winter percussion unit sponsored by CV) last year and will march with Q2 another local area WGI percussion unit this year. Ryan taught percussion at Alexander High School in Douglasville last year and for Mount Zion High School in Carrollton this fall season. He hopes to teach winter percussion at one of the area schools in the near future. He thinks the corps success this season was well deserved and feels as though they worked harder for it this season knowing they had the vehicle to be extremely competitive when they went up North. He stated that DCA has benefited his family by helping them further their experience in the guard, percussion and teaching worlds. It was more of a separation when it wasn’t all of them involved but as they all became involved, it became a similar interest and something that’s brought them all together. Marching alongside his sisters this year wasn’t very different from last season when he was the only family member marching. Ryan felt it really just added on more people to the family they create within the whole corps because he feels every member becomes part of your family throughout the season no matter how close you may be with them. Ryan is planning on pursuing a degree in computer work as he’s always been fascinated with computers and all the things we can do with them. He’s taken coding classes, done an IT internship, done raspberry PI projects, and built computers for himself and friends. He would like to just continue furthering his knowledge of computers and making a career of something he is genuinely interested in. When Ryan is not drumming or teaching he’s probably playing games or watching drumming, computer, or car related videos on You Tube. The Armstrong’s are an amazing example of a family truly immersed in the drum corps activity. Their lives exemplify so much of the best of what drum corps has to offer those willing to do the work to be a part of it. Alan and Ginger are to be given much credit for raising such talented and dedicated young adults. Two of the girls are teachers. A third is planning on being a special Ed teacher and son Ryan wants to be a computer guru. With all this going on, they still find the time to march together with Atlanta CV and with their parents on board as staff members. The 2017 DCA season was a dream one for all the members of the Armstrong family as well as the corps itself. Winning the best color guard award, a second place finish at finals for the corps, and Corps Director, David Stollberg being named Open Class Director of the Year; this was one amazing season for all our friends down South.